illus. by John Parra. 40p. Chronicle. Mar. 2019. Tr $16.99. ISBN 9781452155845. PreS-Gr 1—This companion to Green Is a Chile Pepper and Round Is a Tortilla makes learning numbers in English and in Spanish a fun fiesta for young readers. Through rhyming stanzas, children can count from one to 10, using bolillos, burbujas, paraguas, and calaveras along the way. Each number has its own theme, representing a year's worth of seasonal pastimes and festivals. The book is playful and fun to read and offers plenty of opportunities for bilingual vocabulary development, incorporating recognizable symbols of Latinx cultural heritage. Short, catchy text will hold the attention of very young learners and add to the book's buoyant appeal. Brightly colored, animated illustrations blend the imaginative with the realistic and complement the singsong rhythm, with words and pictures evenly placed throughout. Colors are vibrant, with a diversity of skin tones represented. Plenty of space around the text will facilitate letter recognition and comprehension for beginning readers; Spanish and English words are woven together seamlessly, accurately relating concepts in both languages. 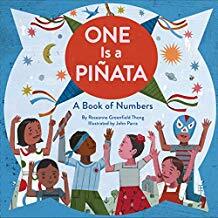 VERDICT An obvious choice for any picture book collection, this book teaches counting skills and new words while celebrating Hispanic and Latinx culture.